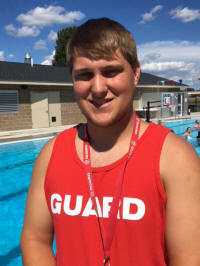 The Marceline Municipal Swimming Pool will be open year-round, so we are always in need of qualified Lifeguards! If you are interested in being a part of the team, please submit an Employment Applicaton to City Hall, 116 N. Main Street USA, Marceline, MO 64658. This facility does not have personal property baskets to store your belongings and personal possessions. Patrons are responsible for any items brought to the pool. This $2.5 million state-of-the-art facility was designed by Larkin Aquatics and constructed by Carrothers Construction. Together as a team, Larkin and Carrothers have completed twenty-five projects utilizing technologies and systems to create cutting-edge swimming pools for municipalities that will be enjoyed for years to come. A special thank you to the John and Donna Moore Family for their generous donation to make this facility a year-round attraction! ALL Children 4 years and under MUST be accompanied in the water by an adult AT ALL TIMES! For private party rental, email Gary Birdsong for availability and scheduling!